It seems simple, but sending your patients seasonal October designs stands out. Most businesses don’t do this anymore and as such when you do, it will stand out that much more! We have regular cards, chiropractic specific designs, funny designs, and cards that are designed to show your thankfulness for your patient while giving them an offer. Now is the perfect time to order your October postcards. 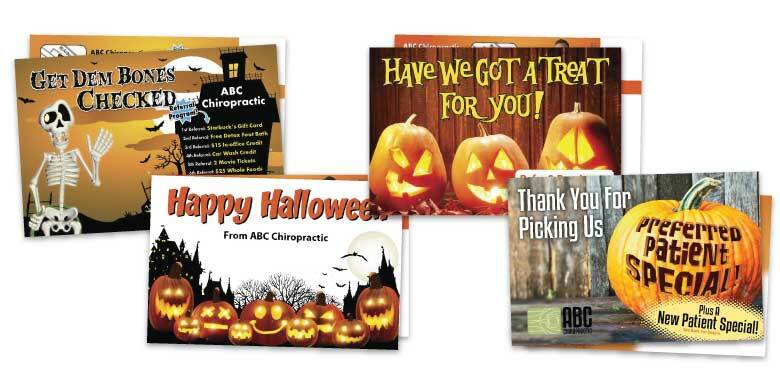 We have Halloween, Fall & Harvest spectacular designs ready to be customized to your practice for FREE! 1,000 4×6 postcards designed and printed for only $99. Use code “SPOOKY” during checkout to receive 30% off ANY Halloween postcard order through this Friday, October 14th. Remember, everything you see in our Online Print Store will be custom designed to YOUR practice for FREE. No “if, and’s or but’s”… Be sure to check out the Special Offers page for extra savings and to reserve a discount code! If you have any questions about ANY of our products, please don’t hesitate to call us at (360) 326-8896 or use our LIVE CHAT service.